June 8 is Pentecost Sunday. Please remember to wear red to church on that day. We will also collect Pentecost Offering during this time. Your Pentecost Offering helps children, youth and young adults at risk. This year, our portion will be split between two organizations: Uplift in Action and Reality Changers. Reality Changers (http://realitychangers.org) transforms lives, schools, and communities by providing youth from disadvantaged backgrounds with the academic support, financial assistance and leadership training to become first generation college students. Thank you for your support. Contact Joe Huffaker through the church office (619) 582-8480, office@fpsd.org if you have any questions. 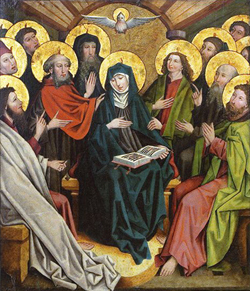 A 15th century German depiction of Pentecost. The notion of Easter as a season of 50 days ending at Pentecost is patterned after the ancient Jewish festival of seven weeks that extended from the beginning of the barley harvest (on the second day after the beginning of Passover) to the end of the wheat harvest at the Festival of Weeks or Shavuot (see Deuteronomy 16:9-12). The Festival of Weeks later came to be called Pentecost (“50th day”) by Greek speaking Jews. In Jewish tradition, Shavuot also marks the giving of the law to Moses at Sinai; this liturgical link may inform Paul’s discussions of the law and the Spirit (see Romans 8, 2 Corinthians 3 and Galatians 3). By cdccastillo in Ministry, Mission on May 30, 2014 .